Gift the goodness of Farmer's Market freshness this summer. Whether it's to say hello, thank you, happy birthday, or congratulations, give the gift of a beautiful meal. We couldn't be happier adding Kansas City Canning Co's addictive jams, preserves and heirloom tomato bruschetta topping to the Manofatto product family. Their goods happily join the Other Brother's extra virgin olive oil grown from California olives, organic 100% Semolina artisinal pasta from Los Angeles, Jacobsen's finishing flaky sea salt from Portland and single origin coffee from various brands in Denver. Product tested, Kate approved. We are passionate about food around here. Never underestimate the power of a really high quality olive oil and crunchy, flaky finishing salt. And please, I beg you, only fresh herbs when finishing off dishes. 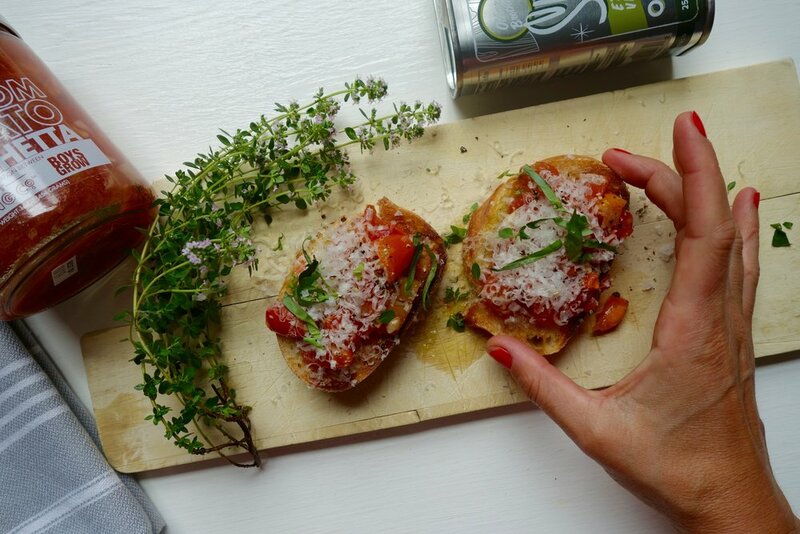 BRUSCHETTA (pronounced brew-ske-ta). Add a big scoop of the heirloom tomato mix to grilled bread drizzled with oil. Freshly grate parmesan or romano on top, adding freshly torn basil (and thyme if you like!) a grinding of pepper and a pinch of flaky salt. Delizioso! Head on over to our online shop to purchase our Buon Appetito Dinner Kit, or email katelyn@manofattoshop.com to chat about a custom order. Also, if there is a small batch American made product that we NEED to know about, please get in touch! We love discovering new brands. Posted on June 14, 2018 by Katelyn Stalowy and tagged denver denver gifts gifts farmers market market fresh foodie denverbusiness shop small farmersmarket denverblog denverblogger denver blog denver blogger food blog foodies freshfood tomatoes bruschetta.